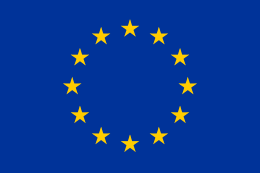 Elections to the European Parliament were held in France on 13 June 2004. The opposition Socialist Party made substantial gains, although this was mainly at the expense of minor parties. 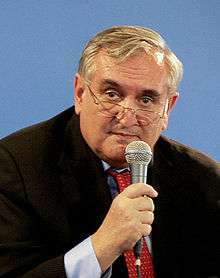 The governing Union for a Popular Movement and Union for French Democracy also made gains. The elections were conducted in seven regional constituencies in metropolitan France, plus an eighth consisting of all overseas departments and territories. Allocation of seats was by proportional representation, with closed lists and no preferential voting, using the rule of the highest average, with a threshold of 5% of the votes in each. 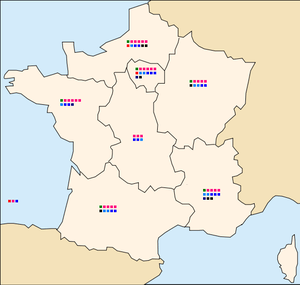 French districts for elections to the European Parliament. Multiple MEPs are elected by proportional representation from each district. 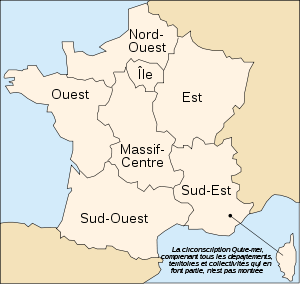 The outre-mer district is not shown. This article is issued from Wikipedia - version of the 7/21/2016. The text is available under the Creative Commons Attribution/Share Alike but additional terms may apply for the media files.